It pays for you to learn. You can save your pet rabbit or rodent's life! Our dental team is dedicated to help you make good decisions for your pets! Ask us for help, allow us to provide an initial consultation ($110). Pets with continuously erupting teeth must eat the correct foods. That is absolutely up to you. A correct diet will help with dental health tremendously. We see pets that cannot eat and this can be life threatening. Traumatic injuries in small rabbits can be life threatening! was severed and the two sides floated independently. This made food consumption impossible. was eating, playing and gaining weight. Rabbits are lagamorphs and they have teeth too! 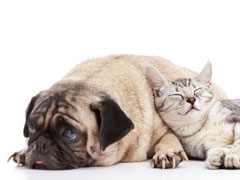 Cats and dogs can live without teeth. Rabbits cannot live without teeth! Any rabbit that is ill needs to have the teeth evaluated because many health issues are secondary to dental problems. In the great majority of rabbits with dental problems, the "cheek (premolars and molars) teeth" are the primary problem and the incisors typically grow too long as a secondary problem. It is critically important to understand that trimming the incisors without addressing the cheek teeth often results in serious problems for rabbits. Incisor and cheek tooth malocclusion are common in domestic pet rabbits. Malocclusions may cause coronal and root (reserve crown) elongation, reserve crown disease, enamel spurs, spikes or ramps. Oral trauma and periodontal disease can also occur secondary to malocclusion. Veterinarians often perform periodic "clipping of the incisors" to address incisor malocclusion. 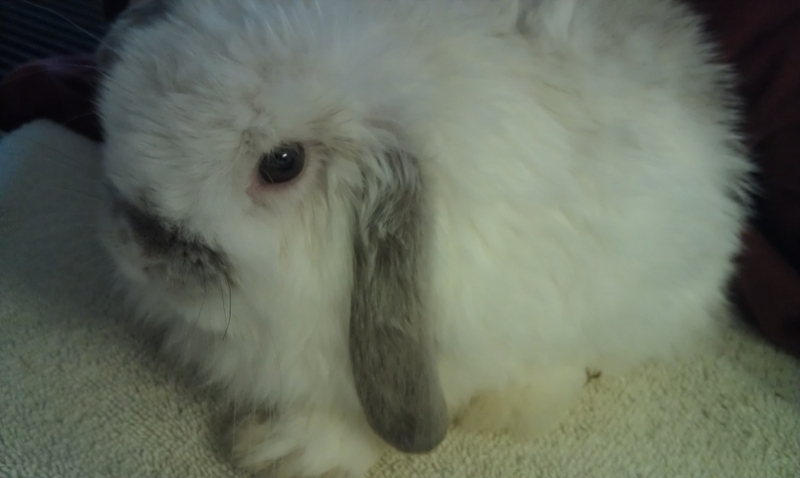 Dr. Kressin discourages "clipping teeth" because it is an inaccurate, painful and stressful procedure for the rabbit. Clipping teeth is difficult to control and may result in tooth fracture which often worsens the malocclusion and may lead to tooth infection. 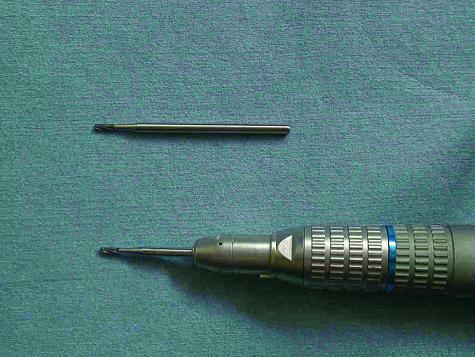 A more effective approach is to use a dental burr to trim the teeth. The cheek teeth as well as the incisors must be evaluated and addressed in each case. Rabbits have continuously growing (erupting) teeth. It has been estimated that these teeth grow between 1-5 mm per week. The rate of teeth growth varies between the different teeth and between individual animals. The caudal cheek teeth erupt 1 to 2 cm (10 to 20 mm) per month. The upper incisors grow approximately 2 mm per week which is slower than the lower incisors, which erupt at rates of 2.4 mm per week. Dental growth can be influenced by age, health, gender (pregnancy) and nutrition. The balance between tooth eruption and tooth attrition (ware) from normal occlusion is thought to be heavily influenced by correct nutrition. This creates unique problems for rabbits. Any rabbit that is not eating, is eating less than normal or is eating the wrong feeds, will develop over-grown teeth. Rabbits need long stem hay as their primary diet. They like hay and it is very important to their dental and overall health. Be careful about feeding pellets and various treats. Commercial pellets are hard and cylinderically shaped. Crushing pellets is accomplished from a vertical (up and down) chopping motion. Little additional grinding motion is required to swollow pellets. This limited grinding activity can result in less tooth attrition and relative tooth elongation. Hay as the primary diet promotes side to side grinding motion required to controll dental overgrowth. Recent research (Comparative Observation of Skeletal-Dental Abnormalities in Wild, Domestic, and Laboratory Rabbits, Journal of Veterinary Dentistry, Vol.24, #4, Dec 2007) has shown that domestic pet rabbits tended to have relatively higher crowns, severe root elongation and advanced periodontitis (periodontal disease). Periodontal disease was demonstrated radiographically as reduction of crestal bone height adjacent to the lower third premolar teeth. Teeth are used to differentiate between rabbits and rodents. Rabbits teeth differ from rodents because of their upper incisor number and arrangement. Rabbits have two upper incisors on each side. The smaller two incisors behind the larger front upper incisors have been called "peg teeth". Rabbits have one lower incisor on each side. Rabbits have three upper premolars immediately in front of three upper molar teeth. The lower jaw is a little different. There are two lower premolars immediately in front of three lower molar teeth. Normally rabbits have 28 teeth. The 2 in the front of the formula indicates the left and right side of the mouth. The I stands for incisor teeth. Rabbits have 2 on top and one on the bottom jaw. The C stands for canine teeth which rabbits normally do not have. The PM are the premolar cheek teeth and 3 are on top and 2 on the lower jaw. The M are the molar cheek teeth and there are 3 on the top and the bottom jaws. Survey skull radiographs are essential to the evaluation of rabbits for oral and dental diseases. See below for the use of diagnosis to establish prognosis. Computed tomography (CT) can be particularly useful to further evaluate teeth and bony changes. Magnetic resonance imaging (MRI) with or without ultrasound can help assess soft tissue structures of the head. The rabbit owner's role in dental health of rabbits. List all foods your rabbit eats; determine what is eaten most to least. What are the brand names of foods (if commercial foods are used)? What treats or other supplements are provided to your rabbit? How long has your rabbit been on this diet? What was its previous diet? If dental care is needed your veterinarian may either provide occlusal adjustments or refer you to a specialist. After occlusal adjustments, you will need to promote early return to eating. Hay must be in the rabbit's diet to provide normal dental ware. For feeding information go to the House Rabbit Society website. 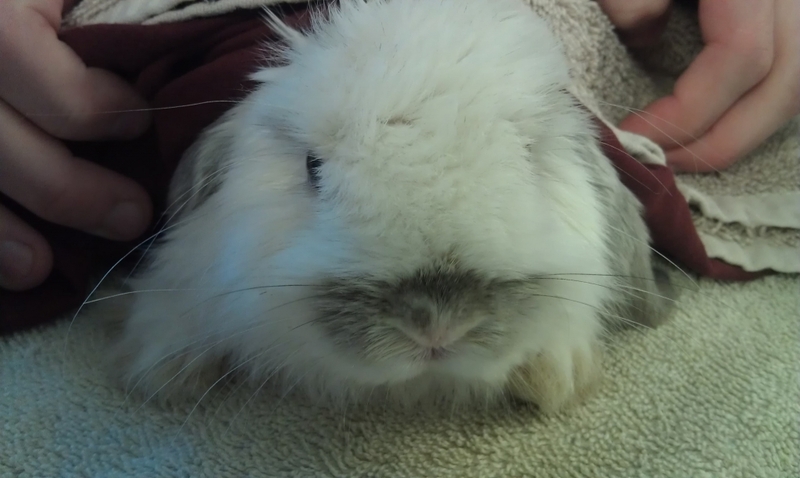 What can the veterinarian do for rabbits with dental disease? The veterinarian always needs to make a diagnosis, establish treatment plans and to perform treatments efficiently. This however is not always easy or inexpensive. Rabbits have a loose TMJ or "hinge joint. This allows the jaw to move side to side and front to back, however there is little up and downward motion. This limits how wide the jaw opens and how well we can see the rabbit's teeth. The size of the oral cavity is deceptively small because of the extensive development of the large muscles used for chewing (masseter muscles). The tongue is relatively flat and short. Rabbits have a very "long diastema" or space between the incisors and the cheek teeth. The lower jaw is narrower than the upper jaw (anisognathism). These anatomic characteristics make it very difficult to view the occlusal relationships. This forces us to rely on dental radiology, general radiology or computed tomography (CT scans) to evaluate the occlusion. These imaging techniques are also used to evaluate for crown elongation, apical elongation, bone loss and for periapical pathology (dental abscesses). As in all aspects of veterinary dentistry, the diagnosis is the first step to understanding the prognosis. Treatment plans must be established based on the needs of the rabbit and the owner. We must address pain and the nutritional needs of these animals. Many of these animals need help with eating initially however it is very important to get tham back to eating a diet composed of long stem hay with fresh vegetables. Balanced nutrition with normal chewing can promote tooth wear needed to offset the continual dental growth. For rabbits unwilling or unable to eat hay, Herbivore Critical Care Formula (Oxbow Pet Products, 29012 Mill Rd., Murdock, NE 68407, Tel 1-800-249-0366) can be very helpful during the transition back to an optimal diet. Rabbits with dental disease should be periodically evaluated by the family veterinarian. The frequency required for professional care is based on the rabbit's oral and dental health. Some rabbits will require very frequent occlusal adjustments when they are unwilling or unable to eat an optimal diet. Rabbits develop periodontal disease, cavities (carious lesions), malocclusions (abnormal tooth alignmant), oral infections, lacerations as well as tooth and jaw fractures. Visualization of the cheek teeth and the oral cavity is challenging in rabbits and essential to provide optimal care. Oral and dental care for rabbits requires specialized equipment, instrumentation, training, time and patience. or the rabbit's oral cavity during occlusal adjustments. adjusted for a "functional" grinding occlusion. the bottom and are approximately 3 cm long. Left side view without incisors. 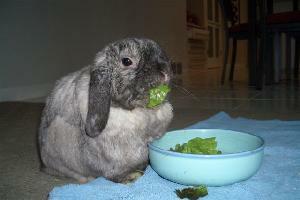 "Slobbers" or "wet dewlap" and anorexia are common clinical problems in rabbits. Skull radiographs using mamography film revealed Grade 3 of 4 dental disease (see grades above). Cheek tooth elongation was evident as demonstrated on dental radiographs below. Cheek teeth elongation of all four dental arcades (both sides; upper and lower). "Taz" like most rabbits have feed "Taz" must eat hay for long-term health. "Taz" is reported to be comfortable! Dental fractures in rabbits can be incidental or very serious. If tooth fracture involves pulp exposure, the tooth may become infected and die. The dead tooth fails to occlude with the corresponding tooth in the opposite arch resulting in malocclusion. The treatment for fractured teeth with pulp exposure is vital pulpotomy. The treatment for dead teeth is extraction. The dead tooth and the occlusal counterpart tooth are ideally extracted to avoid the development of malocclusion. As stated above, teeth evaluation is the basis for the differentiation between rabbits and rodents. Rodents only have one set of incisor teeth and rabbits have the "peg teeth" as the second set. Guinea pigs and chinchillas have continually growing and eruption incisors and cheek teeth as also occurs in the rabbit. This dentition has been called elodont. Hamsters, girbils, mice, rats and other small rodents have continually growing and erupting incisors; however, their cheek teeth are brachyodont. They have a short crown and a well defined root. These brachyodont teeth do not grow continually. 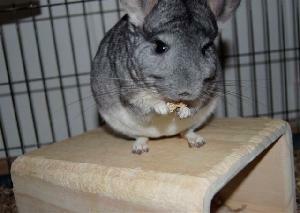 Chinchillas: Kirby and his brother eating. The guinea pig and chinchillas have incisors and cheek teeth that continually grow. The girbel, hamster, mice and rats have continually growing incisors however the cheek teeth are not continuously growing and are classified as short (hypsodont) teeth. Additionally, some hamsters only have 12 teeth as they may have 2 molars (as opposed to 3) on the top and the bottom dental arches. Dr. Kressin performing a brief facial evaluation. As the incisors elongate, they tend to twist. A speculum is used to get an initial overview. Rodents have continuously growing teeth. The number of teeth vary between species of rodents. The diet is fundamental to dental and overall health for these animals. Continuous growing teeth remain functional as a result of the normal wear from chewing feeds. Every time a rodent stops eating, reduces feed intake or becomes anorexic, the teeth may overgrow. The result is a painful mouth and in some cases the inability to eat. This becomes a life threatening problem very rapidly. Early presentation of rodents for a dental evaluation may be life saving. A routine radiograph to evaluate the occlusion. normal in the radiograph above. 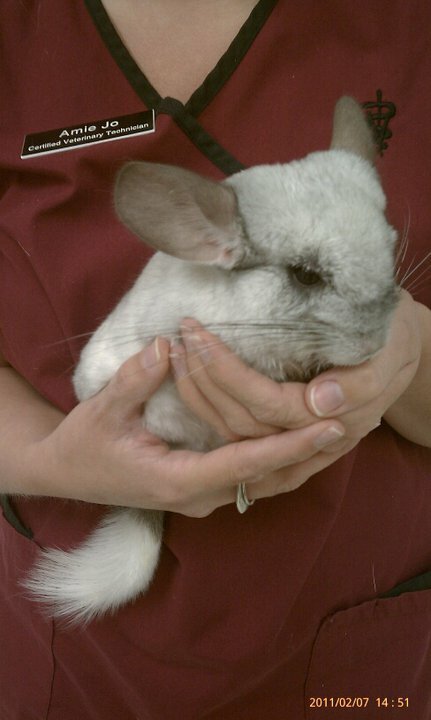 Chinchilla dropping feed and eating less than normal. coronal height creating a "wave" upper dental arcades. Kirby right view. Computed tomography (CT scan or Cat scan) was suggestive of mandibular brachygnathism to the veterinary radiologist. 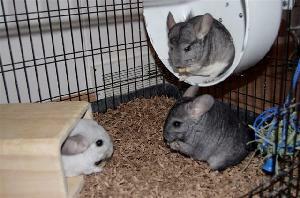 These chinchillas must be fed a diet that will maximize dental wear and periodic professional occlusal adjustments will be required. The owner reported rapid return to normal eating of a diet with long stem hay. The large spur on the lingual aspect (tongue side) of the lower right second molar was causing a deep laceration into the palate. This resulted in pain and discomfort as well as an innefective dental occlusion and abnormal tooth ware. Kirby is back to eating hay! Kirby is eating and quite playful. A comprehensive oral health assessment for rabbits therefore must be performed under anesthesia. Assessments are made for periodontal disease (radiographs and probing), tooth irregularities (tooth spikes or waves of the dental arcades), tooth infection (dental abscesses) soft tissue injuries or for oral tumors. The veterinarian may need to provide occlusal adjustments (grinding teeth down) to imporve the occlusal relationships between the upper and lower dental arcades (arches). Endodontic (vital pulpotomy) therapy can be used to save tooth that are fractured and have pulp exposure. Oral surgery may be required to extract teeth, to treat dental abscesses or to excise oral tumors. Performing dental procedures, such as "teeth trimming" without anesthesia is often ineffective and can be dangerous for the rabbit and for the operator. Dr. Kressin discourages this practice. It is stressful at a minimum and can easily result in injury! Rabbits can be safely sedated and anesthetized. We prefer not to withold feed from rabbits in an attempt to avoid bloat. We also do not withold water to avoid dehydration. It is very important to provide great care with patient warming during the anesthesia and during the recovery period. Balanced anesthesia incorporates analgesia (pain prevention) and allows minimization of all drugs for smooth anesthesia and patient recovery. We prefer to premedicate rabbits with ketamine, buprenorphine and midazalam. Meloxicam, a medication the provides anti-inflammatory effects and pain relief is also frequently utilized. Regional anesthesia is also preferred when oral surgery is performed. Anesthesia induction is by inhalent (Isoflurane or Sevoflurane). We prefer intubation to protect the airway unless a very short anesthesia period is anticipated. It is always preferred to minimize the overall anesthesia time period. For additional information on anesthesia safety see anesthesia concerns. If you have additional concerns regarding pain management, go to pain related concerns. Regional anesthesia or nerve blocks are beneficial when performing oral surgery in rabbits. By blocking the nerve input from the periphery (the teeth and the oral cavity), the general anesthesia levels can be lowered to increase anesthesia saftey. Nerve blocks effectively allow early return to eating and reduces bloating problems after anesthesia. Veterinarians are encouraged to study "regional anesthesia" provided by Dr. Kressin. Every opportunity to reduce pain in our patients should be implemented when dental or oral surgery is anticipated. 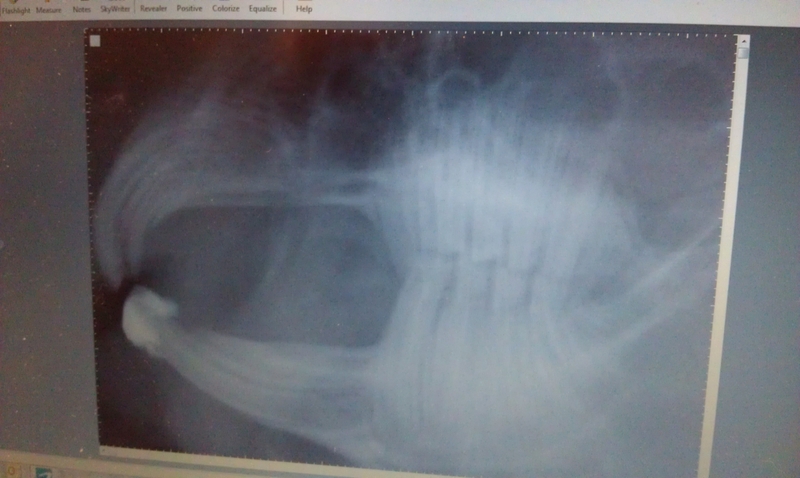 Radiographs are fundamental and essential to helping rabbits with dental problems. Non-screened radiographs provide higher detail and help with the diagnosis of the problem(s). I prefer non-screened mamography x-rays taken from various positions to evaluate rabbits. These radiographs are taken with the general anesthesia. Using radiographs and by performing a detailed intraoral exam, the best approach to treatment is established. The stage of disease is determined which offers a long term prognosis. Grade 1 stage of disease may involve minor malocclusion of incisors. The ventral border of the mandible is smooth and of normal bone density. The roots are of optimal length and appear parallel to adjacent teeth. The occlusal surface of teeth are smooth and linear on radiographs. The prognosis is good after occlusal adjustments are made (if needed) and the rabbit is eating an optimal diet. Grade 2 stage of disease has early radiographic changes. The ventral border of the mandible is thin. There may be root elongation and root divergence from parallel orientation of adjacent teeth. Enlargements of the face or lower jaw may be palpable and there may also be radiographic evidence of bony growth (enlargement). Occlusal adjustments may be needed and with the appropriate diet, the prognosis is good. Grade 3 stage of disease may be significant enough to be resulting in eating habits and weight loss. These rabbits may have substantial infectious disease. Radiographs demonstrate further thinning of the ventral border of the mandible and less overall bone density. Root elongation may be significant causing pain and discomfort. There is further deviation from the parrallel arrangement of the teeth. The bony protrusions (face and mandibles) may be very significant with marked densities on radiographs. The prognosis is guarded. Bacterial cultures are indicated in many cases. Grade 4 is an advanced disease process with obvious clinical signs of poor health. The ventral mandible has perforation of very thin bone. There is significant deviation of adjacent cheek teeth from the normal parallel orientation. The occlusal surfaces appear blurry due to variable cheek teeth length. Soft tissue abscesses are common. Surgical intervention along with occlusal adjustments are indicated. Antibiotic coated beads are chosen based on culture and sensitivity testing to treat the soft tissue infections. Dental extraction is often indicated. Rabbits do well with one or two cheek teeth extraxcted however with multiple extractions, occlusal problems are common requiring periodic 6-12 week occlusal adjustments. The prognosis is guarded to poor based on the individual case. Grade 5 is the most severe stage of dental disease. 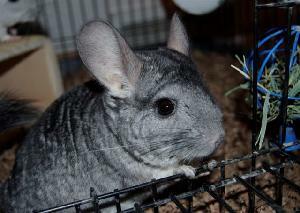 These animals have moderate to severe weight loss, excessive salivation, eye and or nasal discharge with chronic pain. Infection of bone (osteomyelitis) and soft tissue is present. Radiographic evidence of bone destruction is severe. The dental arcades align poorly. Fractured and missing teeth are common. Prognosis is poor to grave. Radiographs help diagnose jaw (mandibular) and tooth fractures as well as periodontal disease, malocclusion and related dental abscesses. This patient suffered from a traumatic injury. The mandibular symphysis was "separated" or "fractured". The left and right mandibles were mobile and would float independently. The radiograph below demonstrates the rotated mandible and torn symphyseal tissue. Paddington was injured and his symphysis was separated. together. The two lower jaws would move independently. The radiograph below demonstrates abnormal occlusal alignment. Occlusal adjustments were indicated and performed. Notice that the ventral aspect of the mandible (lower) jaw appears smooth and is normal.